Congratulations! You’re now on your way to creating a fabulous montage. In doing so, here is our resource center with tips and tricks on getting your photos organized (depending on your purchased package). Follow these 4 steps and you’ll be all set! When you’re finally finished organizing your photos, you can send them to us using the Storyteller Dropbox account. For detailed instructions, click on “Uploading to Dropbox” located on the sidebar to your right. For a more detailed account of all the pricing, process and samples, view our pricing and process sheet – Storyteller Montage Pricing. If you’re doing our Matinee package, we recommend doing this chronologically. Depending on where your photos are stored, you can make one master folder with all the photos. From here, just start dragging and dropping your favorite selects. 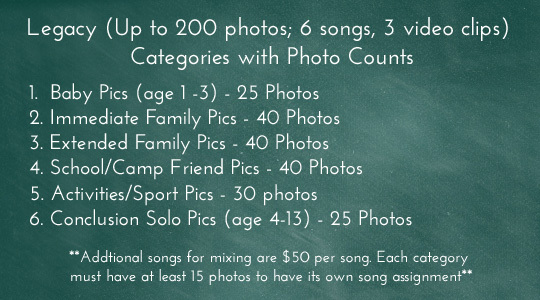 The Feature Package includes up to 100 photos, 4 songs and 1 video clip. Here are some suggested categories. Take note that you can make up your own categories as well (ie: travels, funny faces, etc). You may have certain folders which are more photo-heavy than others. These numbers are just to give you an idea of how to get started organizing. 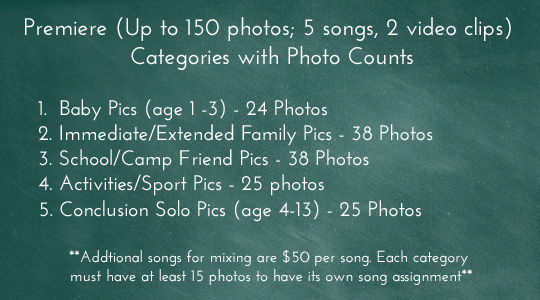 The Premiere Package includes up to 150 photos, 5 songs and 2 video clips. Here are some suggested categories. Take note that you can make up your own categories as well (ie: travels, funny faces, etc). You may have certain folders which are more photo-heavy than others. These numbers are just to give you an idea of how to get started organizing. 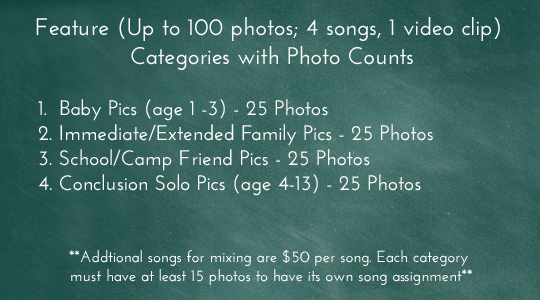 The Legacy Package includes up to 200 photos, 6 songs and 3 video clips. Here are some suggested categories. Take note that you can make up your own categories as well (ie: travels, funny faces, etc). You may have certain folders which are more photo-heavy than others. These numbers are just to give you an idea of how to get started organizing. If the bulk of your photos are stored in Apple’s iPhoto software, we recommend utilizing this software to organize and reorder your photos as you see fit. New Albums (folders) can be made in iPhoto for each of the categories. IE: Make a new album/folder for the Baby category, make a new album/folder for the Siblings category and so forth. You can drag and drop your photos accordingly. Make sure to order them in the way you prefer before exporting. Most people order them chronologically within each album/folder. It’s whatever you prefer. For instructions on exporting your pics properly from iPhoto, click on Exporting from iPhoto. If the bulk of your photos are stored in Apple’s Photos software, we recommend utilizing this software to organize and reorder your photos as you see fit. New Albums (folders) can be made in Photos for each of the categories. IE: Make a new album/folder for the Baby category, make a new album/folder for the Siblings category and so forth. You can drag and drop your photos accordingly. Make sure to order them in the way you prefer before exporting. Most people order them chronologically within each album/folder. It’s whatever you prefer. We realize the interface can be confusing, as many people are still adjusting making the switch from iPhoto to Photos. For instructions on exporting your pics properly from Photos, click on Exporting from Photos. Make one folder on your desktop labeled “Montage”. Make several new folders within the main “Montage” folder with the categories we’ve listed above. Then start dragging and dropping the best digital photos from your data discs, external drives, smart phone, etc. We recommend ordering them in the way you prefer before giving them to us. Most people prefer ordering them chronologically within each album/folder. If you can’t figure out how to do this, don’t worry. You can edit the photo order in our cloud based Smugmug software once we retain your photos. Believe it or not, the music is the most important part of the montage besides the pics. We recommend pairing each category with its own song. 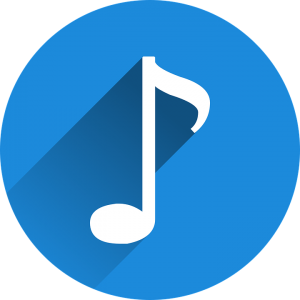 If you’re having problems brain-storming on which song you might want to use, take a look at our suggestions here – Song List. If you chose a Feature, Premiere or Legacy package, you have 15 free paper scans included within the pricing. Each photo thereafter will have a $.50 fee per photo. However, if you prefer to scan the paper photos yourself, please be sure to use our scanning specs! And crop the image before scanning! To see detailed instructions on how to scan properly, look at our Guideline for Scanning Photos. For Mac Users: Right click on the master folder labeled ‘Montage’ and hit “Compress”. Once it compresses, another folder will appear on your desktop called ‘Montage.zip’. This is the folder that you will put into Dropbox. For PC Users: Right click on the master folder labeled ‘Montage’ and click ‘Send to’. Another dropdown menu will appear. Click on ‘Compressed (zipped) folder’. Once it compresses, another folder will appear on your desktop called “Montage.zip’. This is the folder that you will put into Dropbox. 3.) Double click on your assigned folder (your name) to open the folder. Drag and drop the Master ‘Montage Selects.zip’ Folder into the dropbox. Allow it a few minutes to finish. 4.) E-mail us to make sure we received everything! E-mail jenny@storytellerpro.com to let us know that you were able to drag and drop everything okay so we can take a look and start coordinating with you. If you’ve already sent us your media, and still have some deletions to make, these instructions will get you on your way to organizing the photos as you prefer them. You will need your “Photo Outline Link”, which we send to you in an email. For instructions on organizing, Click Here.